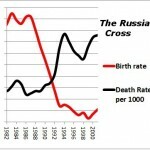 One of the keystones of the “Dying Bear” meme is the factoid that abortions outnumber births in Russia. As Mark Steyn put it, “When it comes to the future, most Russian women are voting with their fetus.” The only problem is that there is no causal relation between abortions and demographic health whatsoever – and for that matter it is no longer even true factually. There were 814,149 abortions in 2012, which is less than 50% of the 1,896,263 births during the same period. 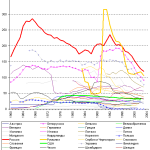 As we can see from the graph above, abortion as a method of fertility control was specific to the Soviet era and has been in rapid decline since the mid-1990’s. 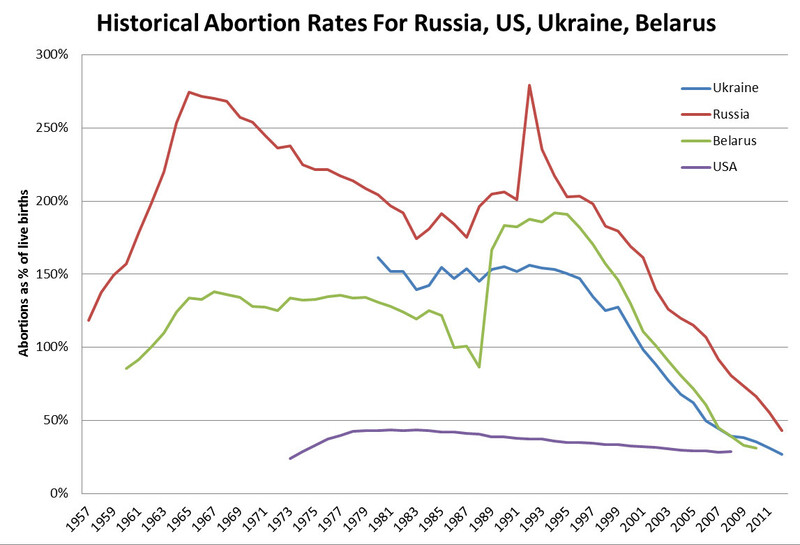 In fact Russia’s abortion rate is now basically equivalent to America’s during the early 1980’s, a decade after Roe vs. Wade. 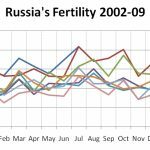 The real story about abortions in Russia is that they have been plummeting in all its regions in the past two decades as it steadily becomes a “normal country” in this as on an array of other indicators; its overall numbers of abortions per live births (43%) are now rapidly converging on the 10%-30% range typical of other developed nations. But this chart also brings us to another point. A recent Weekly Standard article by Daniel Halper, which makes errors beyond demography (no, Putin did NOT invite Boyz II Men to sing fertility chants), reviews a new book by Jonathan V. Last about how the long supposedly doesn’t have enough babies. Not only does he claim that there are 13 abortions per live births in Russia – a statistic that was last true a decade before the book was published! – but that it “suggests a society that no longer has the will to live.” In that case, what would have made of the RSFSR circa 1965, when abortions reached an all time peak of 27 per 10 live births? Well, in 1965 the birth rate (15.7/1000) was double the death rate (7.6/1000), and the total fertility rate was at an entirely sound and replacement level rate of 2.14 children per woman! That is the problem with moralistic rhetoric of the “voting with their fetuses” variety. Not only in Russia’s case is it now increasingly wrong at a basic factual level, along with the “voting with their feet” brouhaha over the non-existence emigration crisis, but it doesn’t even describe how the world works in general. Abortion rates were world historically high in the post-Stalin USSR, but at the same time it had eminently sustainable fertility stats. On the other hand, modern Poland – the lovechild of Anglo mainstream conservatives like Mark Steyn and Jonathan Last – has a blanket ban on abortions, but its fertility rate of 1.3 children per woman is now considerably lower than “dying Russia’s” 1.7 or so children per woman. In reality, abortion tends to be low in low-fertility and high-fertility advanced societies alike, because people get access to pills and realize that wearing a condom is preferable to getting an STD, being saddled with child support, and/or undergoing the physical and psychological stress of an abortion. Russia’s “Abortion Apocalypse”: А был ли мальчик?